"Sometimes, it's not really just luck." Elmer Bendiner was a navigator in a B-17 during WW II. He tells this story of a World War II bombing run over Kassel, Germany, and the unexpected result of a direct hit on their gas tanks. 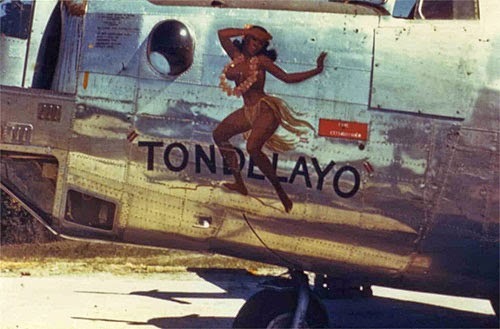 "Our B-17, the Tondelayo, was barraged by flak from Nazi antiaircraft guns. That was not unusual, but on this particular occasion our gas tanks were hit. Later, as I reflected on the miracle of a 20 millimeter shell piercing the fuel tank without touching off an explosion, our pilot, Bohn Fawkes, told me it was not quite that simple." "On the morning following the raid, Bohn had gone down to ask our crew chief for that shell as a souvenir of unbelievable luck. The crew chief told Bohn that not just one shell but 11 had been found in the gas tanks. 11 unexploded shells where only one was sufficient to blast us out of the sky. It was as if the sea had been parted for us. A near-miracle, I thought. Even after 35 years, so awesome an event leaves me shaken, especially after I heard the rest of the story from Bohn." He was told that the shells had been sent to the armorers to be defused. The armorers told him that Intelligence had picked them up. They could not say why at the time, but Bohn eventually sought out the answer. "Apparently when the armorers opened each of those shells, they found no explosive charge. They were as clean as a whistle and just as harmless. Empty? Not all of them! One contained a carefully rolled piece of paper. On it was a scrawl in Czech. The Intelligence people scoured our base for a man who could read Czech. Eventually they found one to decipher the note. It set us marveling. Translated, the note read:"
"This is all we can do for you now..."